Urinary iodine (UI) analysis is the most commonly used method for assessing the iodine status of a population. Ensuring the Quality of Iodine Procedures (EQUIP) is a standardization program that addresses laboratory quality-assurance issues related to testing for iodine deficiency. 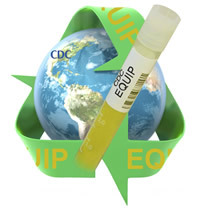 CDC's EQUIP program currently assists over 126 iodine laboratories in over 60 countries. CDC provides each laboratory with quality-control materials, analytical guidelines, and technical training, so that they can accurately measure iodine levels in their national surveys. Three times a year, CDC sends participating laboratories EQUIP samples for analysis.